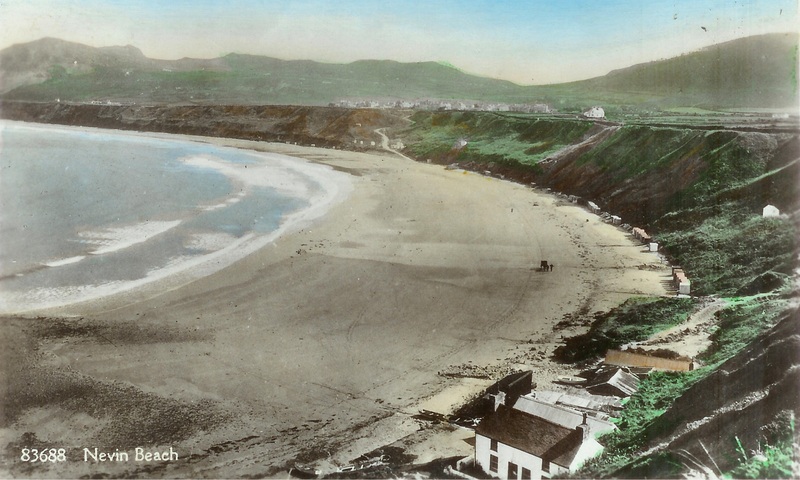 A set of postcard photographs showing one hundred years of Nefyn Beach from 1880 through 1980. The postcards are arranged sequentially in time. 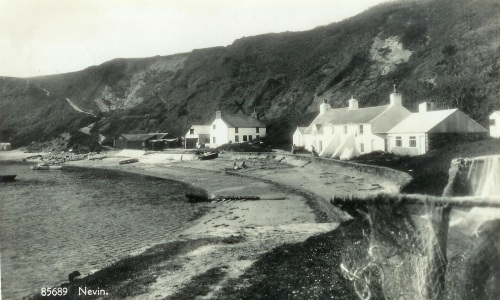 They show the Nefyn beach corner when the hustle and bustle of the sailing ship building industry was slowing down from its peak in the mid 1800’s, and the quiet that followed when the industry finally collapsed in the early 1900’s. The photos go on to show the twentieth century changes to the corner, from the slow demise of a wrecked fishing boat, to the effect of two major cliff landslides, and to the addition of new buildings at the water’s edge. This first postcard has fascinated me for years. 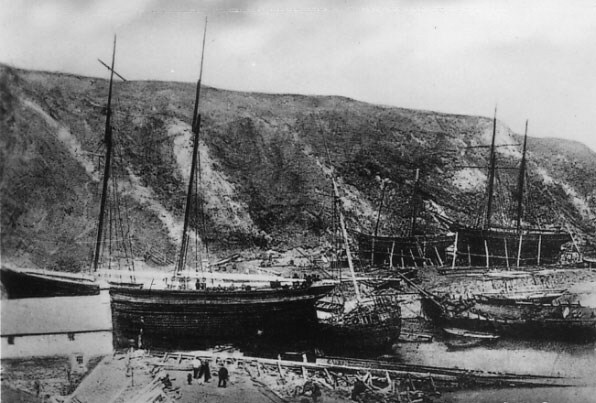 It shows how busy things were in the corner of Nefyn Beach when two two-masted schooners and a brigantine were in the process of being built in 1870’s. This is the only photograph, I believe, that was taken of Nefyn beach during that era. Documents from the period indicate the industry employed shipwrights, carpenters, sawyers, blacksmiths, nailers, painters, turners, block makers, rope makers, sail makers as well as the ship designers and ship owners. A large number of people then worked daily in that beach corner. The schooner in the forefront was the 107ton Venus, the last ship to be constructed at Nefyn. The Venus was built and launched in 1880 from the open area between Penogfa and the Hen Dafarn. The chimneys of the Hen Dafarn, and what was originally a blacksmith next door, are just visible above the deck between the masts of the schooner. These cottages were built earlier, probably in the eighteenth century when Penogfa was truly the “Herring Place” and when Hen Dafarn was truly an “Old Tavern”. Census records indicate that nobody lived in the beach cottages during the mid-nineteenth century, but they probably had occupants in earlier years. The cottages were used during the shipbuilding as offices to direct the planning, supervising, and construction of the ships. The period was without doubt when Nefyn was at its entrepreneurial best. The town will probably never be as innovative and as industrious again. The industry was entirely home grown, and stemmed from the expertise local fishermen had acquired in building their own two-masted sloops for catching herring. Local talent not only designed and built the ships, but also financed their construction, sold shares in their businesses, captained, crewed and sailed the ships all over the world’s oceans, and even initiated an insurance business underwriting the ships and their cargoes. Nefyn was viewed as a center for shipping commerce, and the companies in town insured many ships based in other ports around Great Britain. In 1878 the combined valuation of vessels insured by the Nefyn companies was in excess of 2 million pounds. 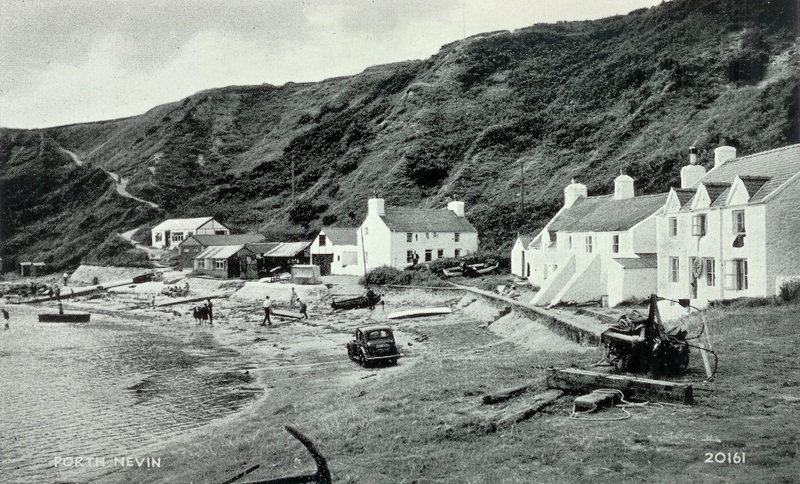 The prominent people of Nefyn in those days were the ship owners, ship builders, and ship captains – true leaders with productive occupations contributing directly to the wealth and well-being of the community. Those were the successful individuals of the time, and they were the ones who started building the large homes in the west end of town. The period stands in sharp contrast to the downturn that followed at the beginning of the twentieth century when solicitors and bankers became the most affluent people, and who contributed little to the wealth and growth of the area. Given this historical significance, one would have thought Nefyn Beach would be hallowed ground for local people – but not so. It amazed me when I was young how the locals treated the place with such indifference. They were just not interested in the area. There were pupils in my class in school who never set foot in the beach corner even though their forefathers had toiled there throughout their working lives. In all fairness though, the community did in later years convert the old St. Mary’s Church into a museum with artifacts and photographs to commemorate Nefyn Beach‘s historic past. The second photo postcard was taken thirty years later around 1910 after the shipbuilding had collapsed. The sailing ships were gone, and even the slipway on which the mighty Venus was launched in 1880 with much hoopla was history. Very little traces of the industry were left just a couple of large winches (one still stands facing the old slipway), a few iron rings embedded in the rocks in Creigiau Mawr (used in conjunction with the winch to launch ships), and an odd large anchor or two. Such an anchor is shown on the postcard just above the large boat. The entrepreneurial spirit had subsided, and the beach corner at Nefyn was back to its prior status with just a few fishermen plying their trade. 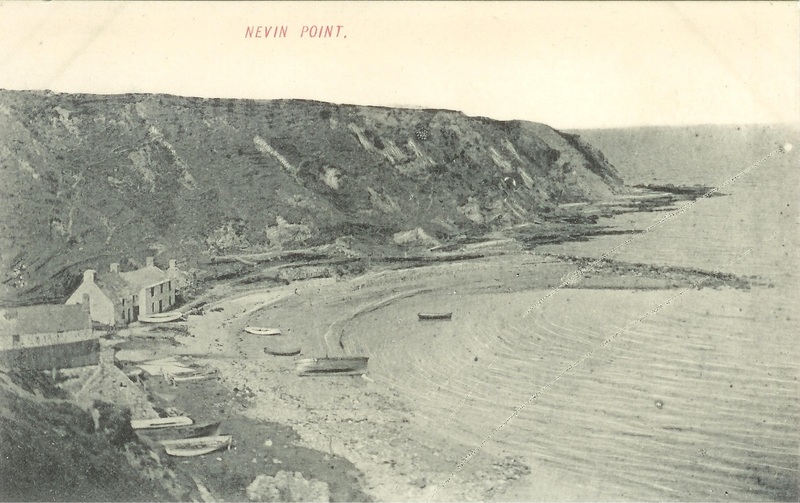 This third postcard is dated 1920, and is titled on the front “A Quiet Spot Nevin Bay 20”. In the forefront, is the wreck of a fishing boat belonging to fishermen Robert Humphreys and John M Jones (Jac Main) both of Nefyn. The masted fishing boat slipped its mooring in a fierce northwesterly gale in the early summer of 1920, and the boat was driven over the tip of Creigiau Bach sustaining serious damage. The wreck finally settled in the sand directly in front of the beach cottages, and was left there. It became a favorite spot for children to play. Some other observations from this photograph are worth noting. A boathouse was erected on the left side of the Hen Dafarn encroaching on the area where the Venus was built. The old established footpath from the cliff top down to the beach is just visible on the cliff side above Penogfa and just above the Hen Dafarn boathouse where the footpath emerged on to the beach. Only a very few local people today, such as Dafydd Hughes and Gwilym (Maes) Jones, know of the existence of this path. It was the path used by most of the men who came from the western end of Lleyn to work on the Nefyn sailing ships. They walked to work along miles of country lanes from Morfa Nefyn, Edeyrn, Tudweiliog, Dinas, Madryn, Ceidio etc. They came through the old giat fochyn (pig or kissing gate) at the top of the cliffs, and down that footpath onto the beach. 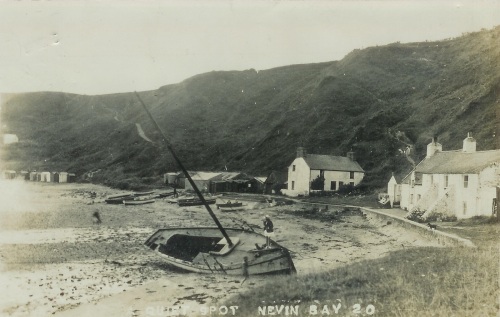 Most of the Nefyn men and those from the eastern end of Lleyn walked to work along the cliff path and then down the footpath shown behind the boat’s mast. This footpath took a sharp turn to the left halfway down the cliff (due to the presence of a spring on the cliff side), and ended on the sand by the bathing huts (see the person coming off the path on the left side of the photograph). The footpath by the Hen Dafarn ceased to be used after around 1890, and was almost totally overgrown by 1920. Another newer path from the headland (shown later in a different view) was also established by 1920. Also note that the LaCasina Café had not yet been built, and the area where the rowing boats were pulled up by the fishermen’s sheds was covered with loose stone. This fourth postcard dates from approximately 1924. 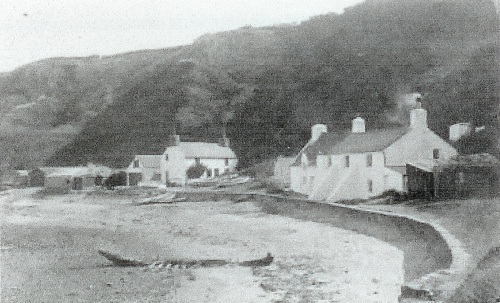 As indicated earlier, there were only two attached cottages on the beach at the time. The third cottage Hafod-y-Mor had not yet been built. 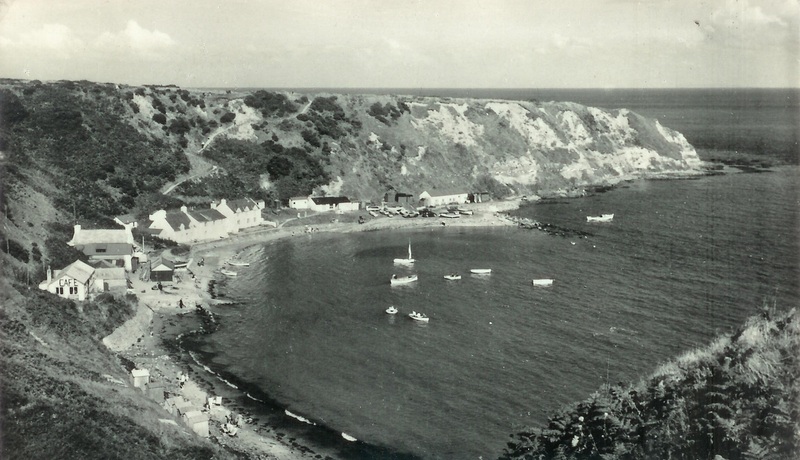 Its future site (right side of the photograph) was occupied by a hut, which was used by the fishermen to smoke herrings. They would string up their herring catches in the hut, light up a fire, and smoke the fish thoroughly for many days. The hull of the wrecked fishing boat was by now reduced to a bare keel and a few remnant ribs. The fifth and sixth postcard photographs were both taken around 1930. They highlight the first significant landslide that occurred on the beach. The landslide did not damage any buildings, and occurred where the LaCasina Café was later located. It was caused by the previously mentioned underground spring on the cliff side, and apparently by an excessive amount of rain. The landslide scarred the side of the cliff, and rubble from the slippage extended way out onto the beach. Both photographs show muddy water still flowing from the spring over the slippage area. Notice the horse and cart on the beach. Horse and carts were used in those days to disperse such rubble. Also note that the land where the smoke hut was located had been sold and the hut replaced with a shed (shown just above the fishing net). This seventh postcard is dated around 1935, the year the third cottage Hafod-y-Mor was completed. New vegetation has now grown over the upper area where the landslide occurred a few years earlier, and a path has been established over the lower part (extreme left). The loose stones around the fishermen’s sheds had been removed, and the area concreted over. The keel and ribs of the old fishing boat was still visible on the beach below the cottages. 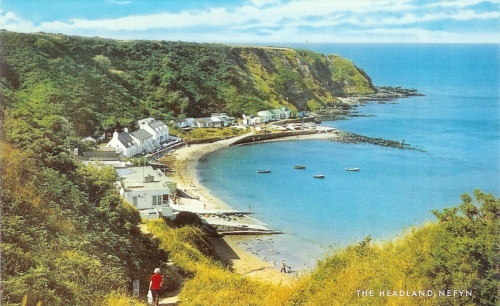 The eighth postcard is dated around 1950. By this time the LaCasina Café was built on the site of the old landslide. A retaining wall was constructed on the beach just below the Café, and some large boulders were placed on the beach as a buffer. The water that was flowing from the spring was diverted to the left of the retaining wall. Building retaining walls and providing drainage for springs from the cliff side helped to minimize the risk of further landslides. The footpath from the cliff top was by now firmly re-established with the lower part passing over the retaining wall in front of the café. The keel of the old wrecked fishing boat had disappeared into the sand. The ninth, tenth, and eleventh postcard photographs show the Nefyn Bay corner from a different vantage point, and with a northwesterly perspective. The ninth postcard is also dated around 1950. The postcard shows the new footpath formed before 1920 after the old established footpath went into disuse. This new footpath zigg-zagged down the cliff side off Nefyn Point behind the Hafod-y-Mor cottage. I used this footpath frequently when I was a child, since my father’s beach hut was located nearby. Another small building, shown just above Penogfa, had been erected on the cliffs directly behind the Hen Dafarn. The postcard also shows the LaCasina Café on the left, and the retaining wall below. 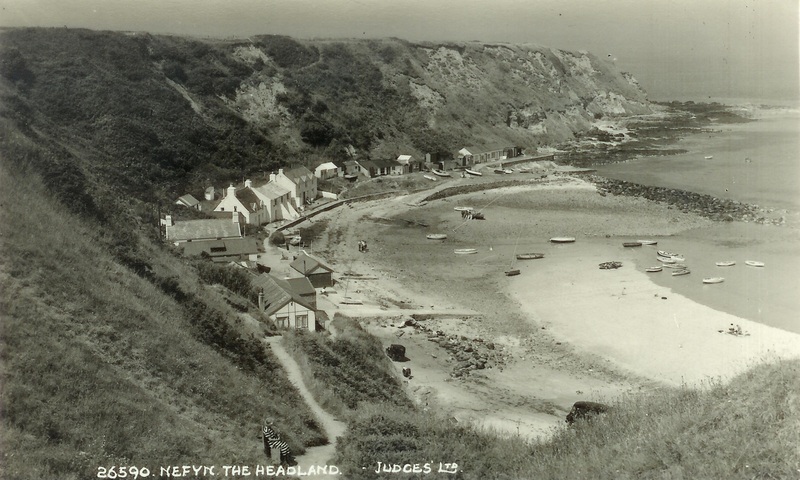 Around 1954, a second major landslide occurred on Nefyn beach. I remember it well. It occurred just north of the Hafod-y-Mor cottage, and it took out completely the new footpath that zigg-zagged down off Nefyn Point. The slippage destroyed several small huts at the base of the cliff. The tenth postcard, taken around 1956, shows the scarring on the cliff from that landslip. The owner of Hafod-y-Mor fenced in the area behind and to the side of the cottage so no footpath could be re-established there. The postcard also shows that the only access to the beach corner thereafter was via the footpath in front of the LaCasina Café. The eleventh postcard shows that by 1975 vegetation had grown over the site of that second landslide. The LaCasina Café had sadly been taken down, and replaced with a house on stilts that still stands there today. The remnants of the wrecked sailing boat was buried forever beneath the sand in front of the cottages, a sand that got several feet deeper after the upgrading of the Creigiau Bach breakwater was concreted over in the late 1980’s. This postcard, taken by Jones the local chemist, also shows my mother Maggie Owen using the footpath on her way down the beach. She just loved that “Quiet Spot” which was the beach corner. The twelveth and last photograph steps back one more time in history. 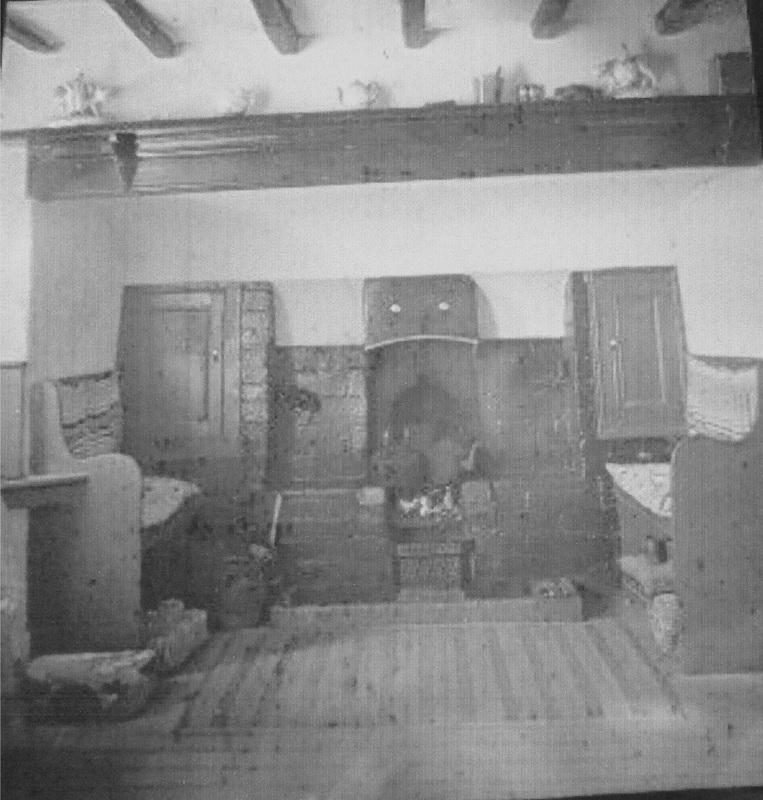 The photo came off a glass slide I recently acquired showing the inside of the Hen Dafarn in 1941. It shows the view to the left towards the fireplace after you entered through the front door. Please note the two airing cupboards on either side of the fireplace, the two settle benches with high-backs with storage underneath, the high shelf above the fireplace, and the wooden beams in the ceiling. 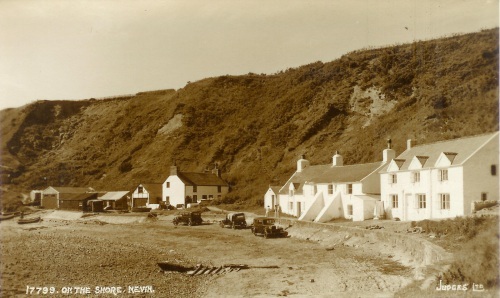 Although I am sure things had changed by 1941, it is not too difficult to imagine this scene one hundred and fifty years or so earlier when the building was indeed a tavern with young sailors sitting around the fireplace getting ready for a long sea voyage on a schooner anchored out in Nefyn Bay.